If you have been following our tour diary, you will have picked up that we often comment on the environment, in all its beauty and/or visible degradation (or often invisibity due to the impenetrable smog). Creative work generally has a low carbon footprint. However, it’s unarguable that hopping on a plane to tour your creative endevour generates a massive carbon footprint. As creative workers, we wanted to attempt to offset our impact as best as possible. Our work is not more important than the sustained ongoingness of life on this globe. For this tour we have chosen to utilise the services of Ekos, a NZ charity that produces internationally certified CO2 offsets from rainforest protection carbon conservation projects. 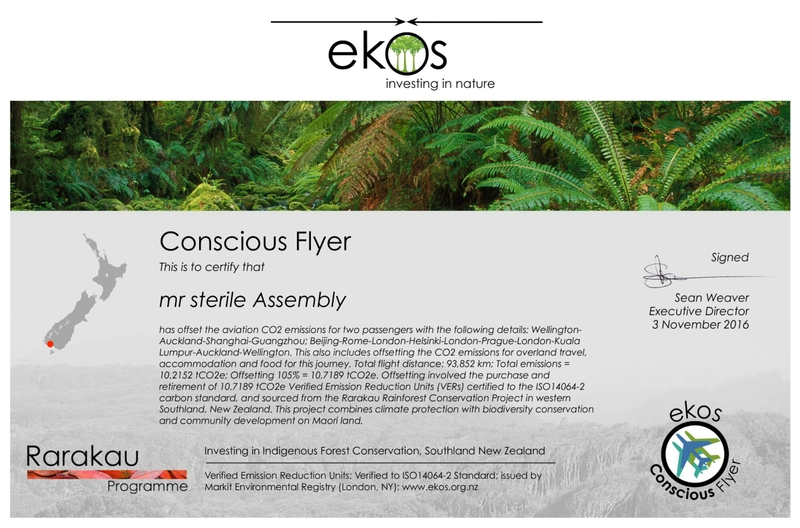 When we offset our flight emissions with Ekos we supported the Rarakau Rainforest Conservation Project on Maori land in western Southland, Aotearoa NZ. And it was easy and affordable. Ekos also has certified rainforest protection carbon projects in several Pacific nations. “Most of us understand the need for infrastructure to support and enable our economy and wellbeing. Water, energy, waste management, transportation, communications, self defence… Without sufficient investments in infrastructure, the services we enjoy from them cannot endure. Ecosystems are also ‘infrastructure’ – they provide beneficial services to our wellbeing. For example rainforests provide water quality, water supply, flood protection, drought mitigation, climate resilience, nutrient cycling, food fuel, and building materials. These services are central to our economy, and nature provides them for free – until we kill the geese that lay the golden eggs. A smart economy takes advantage of nature’s helpers by investing in their maintenance and durability. We hope other creative practitioners and festival organisers can hook up with a services like Ekos and make reducing their carbon footprint a regular and expected part of creative responsibility and activity. It is encouraging the hear that some big festivals are discussing with Ekos ways to minimise the environmental impact of their festival. FYI: A couple of books have stretched our thinking about making bigger connections. Donna Harraway’s book, Staying with the Trouble: Making Kin in the Chthulucene stirred lots of conversations. She talks about how this new epoch, our current age, has been termed as the Anthropocene, the age where humanity-collective is responsible for the multi-environmental/multi-species damage. Harraway suggests this concept isn’t big enough, or accurate enough, and suggest that the term Capitalocene is more apt: that the fundamental driver of environmental and species damage done is the economic model of Capitalism in all it variants, not ALL humans. Naomi Klein also discusses the links between capitalism and climate change in her book, “This Changes Everything“. Klein also discusses the low-carbon footprint of creative work. Both books are well worth read. This entry was posted on November 12, 2016 by chrissiebutler. It was filed under Commentary, shows and was tagged with Anthropocene, Capitalocene, Climate Change, Donna Harraway, Ekos, Naomi Klein, Staying with the Trouble: Making Kin in the Chthulucene, This Changes Everything.